We have a variety of favorite walks through our local woods and, as we repeat paths to create trails, we have started naming them. It helps in conversations. Before the current stretch of rain started David and I hiked the loop that includes Soggy Bottom Trail. 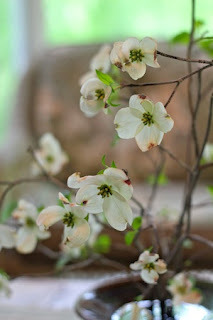 It isn't always passable but we managed and I noted a wild dogwood tree bordering the swamp in full bloom. David always has a jack knife and he harvested a branch for me. I used it to create my latest centerpiece. 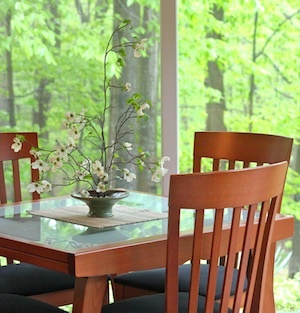 The spacing of the blossoms and the crooked construction of the branches lends perfectly to an oriental presentation. Several months ago,while considering spring arrangements, I had found these porcelain dogwood blossoms available online at Pop Deluxe. 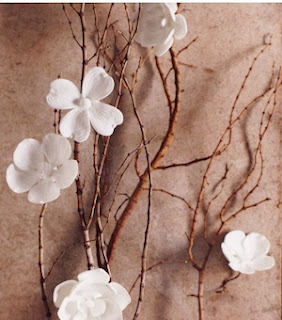 I think, when attached to crooked branches, they too would make a gorgeous centerpiece that wasn't limited by a growing season - or by having access to a wild dogwood tree in full bloom.